Watched by Chris Arnsby. Mike Read: "Due to an industrial dispute we're doing tonight's Top of the Pops live from the canteen at the BBC." Janice Long: "Oh thanks, I'll have a cup of tea. We've got some great stuff in the show people like Carmel, and Nik Kershaw, and this lot over here. It's Hot Chocolate at number 28." This edition of Top of the Pops is coming from a smaller studio and the scenery has been assembled in a haphazard way. Mike Read and Janice Long stand in front of a photographic enlargement from the title sequence. The neon logo is present but it's jammed between scenery units from another stage. Lights are hung from a lower ceiling, or from scaffolding off to one side. The audience are packed in more tightly because there is less space for them, and less space for cameras. The rigid walls of neon lights that made a definite edge to the performance space have gone and once again Top of the Pops looks like it's coming from a black void rather than a television studio. If I'm honest, I like the way it looks. The band stages seem a lot lower, and the audience intrude on shots more that they do in the usual studio. There's a brilliant long shot Errol Brown. The audience are clapping their hands over their heads and because the camera is focused on Errol the hands (and balloons, and flags) become weird soft-focus shapes in the foreground. Frustratingly I can't grab a good still image to illustrate the effect. In motion it looks great. In still form it looks as if Errol is being attacked by an out of focus octopus. 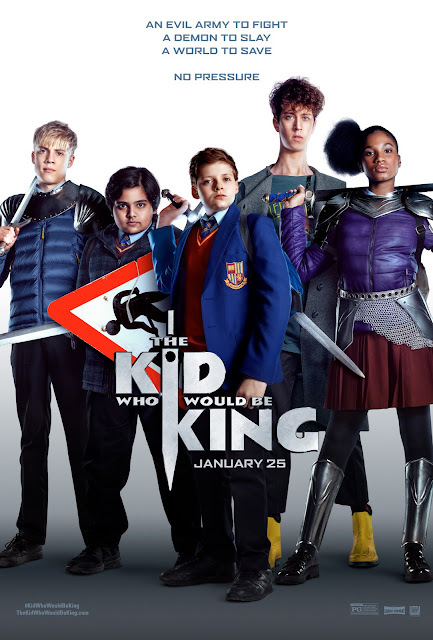 A modern take on the King Arthur story delivers lively results in Joe Cornish’s long anticipated follow up to the brilliant Attack The Block. Aimed mostly at a slightly younger audience it nonetheless contains enough of interest for all ages harking back to simpler times when pure adventure was about heroic deeds, inspiring words plus an essential sprinkling of magic. These days it seems like a preferable option. Watched by Chris Arnsby. Peter Powell: "On video we've got The Thompson Twins, in the studio we've got The Style Council, we've got Matt Bianco, and Nena but for starters this is Slade and Run Runaway!" 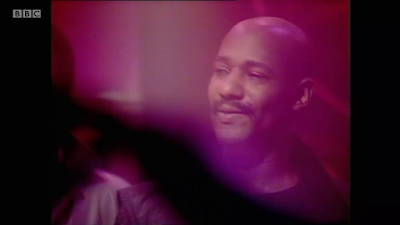 Simon Bates: [laughs]. 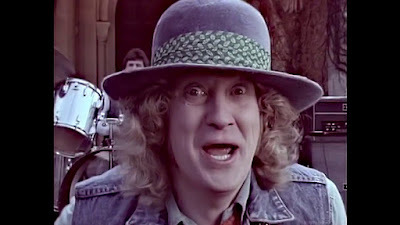 Slade: Run Runaway. Recently I watched an old episode of Crown Court (this is going somewhere, honest) in which Roy Marsden played a shop manager wearing a floral-patterned, grey-green, shirt with hideous matching fabric tie. The combination was so criminal he should have been immediately sent down for 20 years hard labour with no possibility of parole. Fortunately he wasn't the defendant. He was there to give evidence. I haven't thought about Crown Court since before it ended in 1984, whenever I was last off from school sick and lounging in front of the television with a Lemsip. Despite that, in the moment between hitting play and the theme, I realised I could make a reasonable stab at singing the tune. It had lodged itself deep in the recesses of my memory. Here comes the point. Run Runaway had exactly the same effect. I don't know how long it's been since I last heard this song but it popped into my memory fully formed. Even the cheerfully nonsensical lyrics about chameleons. It's a great song and a terrific way to start the show. It is remarkable that in an era that has brought us fake news, an actual proven and obvious fact is apparently now being questioned by an increasing number of people. In the past couple of years there has been a considerable rise in the number of so called Flat Earthers who believe the world is not round but flat and presumably if you sail too far you’ll tumble over the edge into some inky void. As far as I can tell there’s no Inky Void Cruise available. This trend comes despite the proliferation of photographic and filmed evidence showing the Earth from above that has been taken by countless space missions. It is a rather unfortunate coincidence that this year also sees the fiftieth anniversary of the first Moon landing (which of course some people believe was faked). It says something about our thinking that in the half century since that `giant leap` we’ve shifted from marvelling at the wonder of space to questioning the shape of the planet. Every time a slightly quirky female singer emerges comparisons with Kate Bush are never far behind. Yet in 1975, some three years before `Wuthering Heights`, there was Noosha Fox. Though she was not a solo artist nor penned her own material there is something in her charismatic presentation that seems to foreshadow Bush’s subsequent image to some extent. Noosha Fox’s time in the spotlight was comparatively brief and she remains destined to be a footnote rather than a chapter in the history of pop music but it’s an intriguing note nonetheless. At a time when most of pop’s unconventional performers were male she brought something a little different to the party. 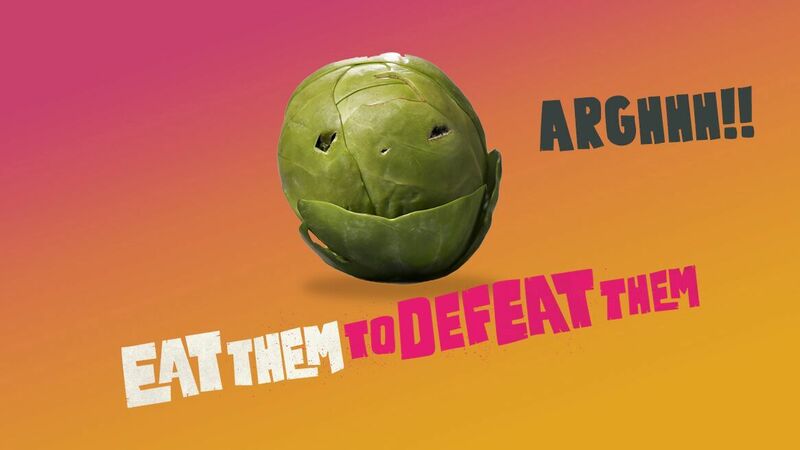 “Eat them to defeat them!” declares this rather dynamic advert in which evil looking veg emerge from under the ground to bare their teeth and terrorize the neighbourhood. “For years the grown ups have been keeping the veg invasion at bay… but they can’t do it alone” the voiceover continues over scenes of people battling broccoli and clashing with courgettes. Kids can help apparently by eating more veg hence the slogan. “Peas- you’re going down” yells a girl as the offending items are brandished on a fork before she eats them. This admittedly well- made amusing ad seems to give off some very mixed, even confusing messages about vegetables. You can see where they’re coming from but I’m not sure it will have quite the intended effect especially amongst younger children who may be put off by some of the imagery used. So what’s going on? Reviewed by Chris Arnsby. John Peel: "Hello there and welcome to another live Top of the Pops. Usual mixture this week, cute DJs, lots of dry ice, and some hot music." 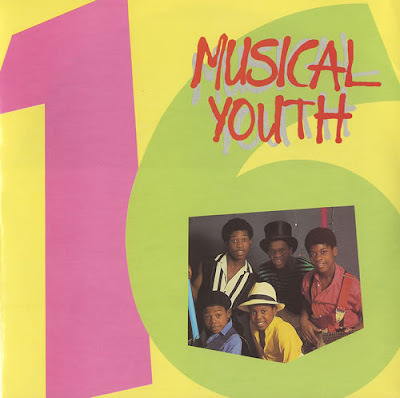 David Jensen: "And our first toe-tapper tonight comes from Musical Youth with Sixteen. Say John, were you ever sixteen?" John Peel: "No. Not really. No." David Jensen: "Take it away boys." Musical Youth: Sixteen. 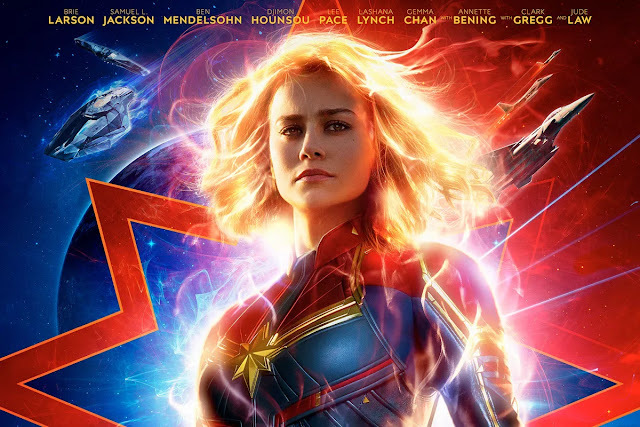 The studio microphones are faded up early with the result that an audience member's excited shriek is audible during the title sequence; maybe she's a real fan of slit-scan. "I'm sixteen" lies Kelvin Grant (born 1971) as if he's trying to sneak into a matinee of Police Academy. I realise the band has hitched their image to the "youth" part of their name but maybe an older band member could have taken this one? Sandra Lobba looks to be risking long-term spinal damage each time she hunches down to gaze lovingly into Kelvin's eyes. 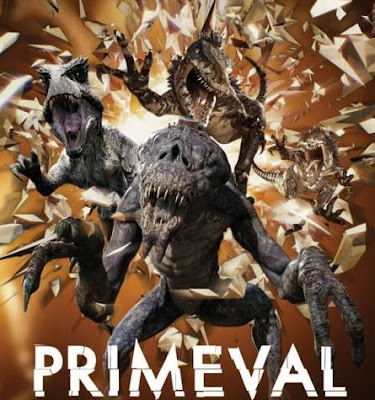 Primeval has always lurked around the edges receiving nowhere near as much respect as many other well known fantasy shows yet if you talk to anyone who watched it they actually quite enjoyed it. Perhaps the word `quite` is the clue here. Somehow the programme never managed to be outstanding. Its flaw was built in from the start- dinosaurs emerge from anomalies and then they have to somehow have to be sent back through them. This led to some repetition though to their credit the writers did their best to introduce human drama in which to frame the monster chasing characters. Set up ostensibly as a family show the amount of gore or horror they could get away with was also limited. The first three seasons were originally reviewed in the fanzine version of This Way Up between 2007-9. Seasons 4 and 5 are already reviewed on this blog so it’s time to complete the set starting with this review first published in 2007 and we’ll also be reviewing the Canadian iteration for the first time. 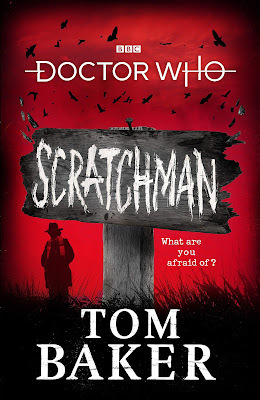 The elusive Doctor Who movie may always remain just that but this story idea from the minds of Tom Baker and Ian Marter appears to have made it further than some back in the Seventies. 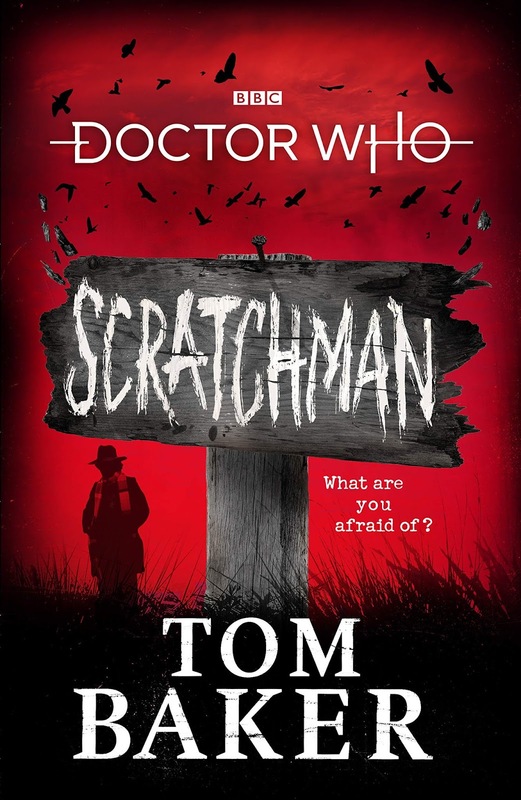 Now its finally been realised albeit in a novel credited both to Tom along with James Goss. If it is unclear who pens the lion’s share of the words the source of a lot of these ideas certainly reeks of Tom’s frothing imagination. And select any random paragraph and you can easily imagine Tom’s mischevious tone reading it out loud. That being the case this does not particularly seem like a Doctor Who story either of 1975 vintage or indeed any other era. It imagines the series taken into full on horror territory and frankly makes `Talons of Weng Chiang` look all sunny and pleasant in comparison. Had it been made back then few of the Doctors’ fans would probably have been allowed into the cinema to see it such is the level of violence. Theft caper movies appear often but its rare to see one where the job goes so awkwardly wrong. Based on a true story American Animals tells how four students attempted to steal several priceless books from a University library. It may not sound too exciting but director Bart Layton gives it the edge of a more ambitious caper reflecting the way the students themselves approach the job. There is infinite planning and prep, even disguises (that amusingly only draw attention to their presence) and some tall stories along the way. Ringleader Warren Lipka may or may not invent an entire sojourn to Holland to contact dealers who will handle the goods. The first run at the job is aborted but the second is even less successful with the wannabe thieves beaten by a series of practical problems like finding keys and the sheer physical weight of a volume they attempt to lift. 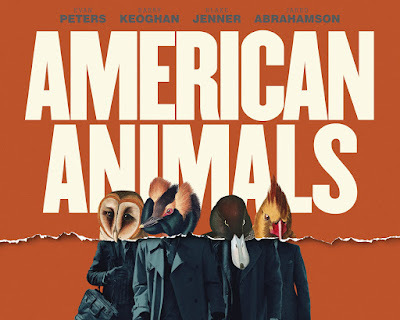 It could be a comedy but the dark palette and serious faced acting means it is a rumination on how reckless ideas and peer pressure can carry people a long way from their comfort zone.